The Petlowany Three-Band Burner is a simple, low-cost, trapless short vertical antenna which amazingly works on three HF bands (20, 15 and 10 meters). This web page contains pictures, performance data, and enough construction details so you can "homebrew" your own. 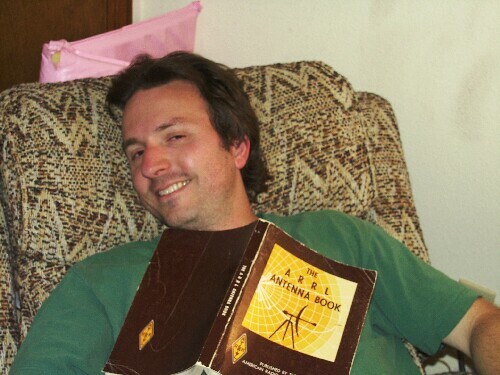 A ham named Bill Petlowany (K6NO) published an article in the March 1998 issue of Worldradio magazine, reporting some interesting results from placing spiral coils on the ends of antennas. A handful of others have experimented with these peculiar antennas. (Another article by W. Caldwell (WA8ABE) appeared in the June 1999 issue of Wires and Pliers.) I kept Petlowany in the name of my variant in honor of the original experimenter, and called it a burner because of its shape. Fundamentally it's a quarter wave ground plane with 4 radials cut for 15 meters. 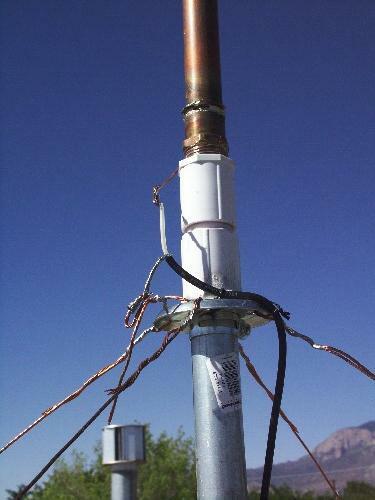 The interesting twist is the spiral coil "hat" on top, which makes the antenna resonant on 20 and 10 meters as well. The higher wires you see in the picture are guy wires, broken into small enough pieces that the RF doesn't see them. They're not really part of the antenna, electrically speaking. Performance-wise, it is pretty much indistinguishable from a quarter wave ground plane vertical on all three bands. As such, it does a reasonable job of delivering the low angle radiation required for DX operation. Here are some SWR charts, to demonstrate the antenna's performance on various bands. These are actual measurements of the antenna pictured. Here are the three bands that give the Petlowany Three Band Burner its name. Here are two more bands that will at least accept power. Performance isn't great on these bands, but it's usable in a pinch. SWR chart for 80 meters (2:1 at 3.5, 2.5:1 at 4.0) SWR is high but it won't cook your finals. For an antenna this short to do anything on 80 is pretty nifty. SWR chart for 2 meters (1.1:1 at 144, 1.5:1 at 146) Don't let the low SWR fool you. The vertical is so long for 2 meters that most of the energy goes up at a 60 degree angle. 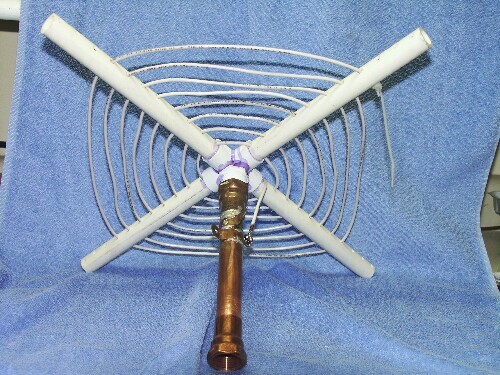 Following are detailed instructions for building the antenna as I have built it. Naturally many other types of construction are possible, and different dimensions could yield antennas that work on other frequencies. Most everything can be found at a hardware store and a radio shack. Click the picture above for a more detailed view. The spiral coil is wound on a form built of half inch PVC pipe. The first step is to make the coil form. Cut four pieces of half inch PVC 20 cm long. Insert one of them into the half inch PVC cross as far as it will go. Make a mark on the pipe where you would be able to drill a 3/16 inch hole as close as possible to the cross without touching it. This is the hole through which the first turn of the spiral coil will pass. Remove the pipe from the cross and make additional marks every 2 cm all the way out to the end (the long way, away from where the cross fits). Use the first pipe as a template and mark the other three pipes the same way. Now drill 3/16 inch holes as marked, all the way through both sides of all four pipes. Using PVC cement, glue the four pipes into the cross to make the coil form. Be sure to glue the right ends of the pipes, so the innermost hole is close to the cross without being obscured by it. Take care also to keep the holes in line with the plane of the cross, so a coil can be wound, as in the picture. Use 5 meters of 12 ga. wire for the spiral coil. Any type of wire is suitable electrically. I used wire with a slick insulation for ease of threading through the coil form. Starting from the inside, leave 10 cm of slack for the inner coil connection, and thread the wire through all four innermost holes in the coil form, pulling it tight. The final step in making the spiral coil is attaching the 3/4 inch male PVC plug to the side of the cross, so the coil can be screwed down onto the copper pipe. To do this, rough up one side of the cross with sandpaper. If you will do most of your communication in the Northern Hemisphere, let the coil run clockwise... (just kidding!). Also rough up the flat end of the 3/4 inch PVC male plug. Slather on some PVC cement and hold the plug in place until the glue has a chance to set up. Here is a close-up picture of the joint between the plug and the cross. It may not look strong but PVC cement forms a strong chemical bond. Do not screw the plug into anything until the glue dries overnight. As you can see in this detailed photo, I sweated on mounting brackets near the top end to make available four holes at right angles. Once I'm sure I won't want to take down the antenna for a while, I might use those to attach ropes to steady the top of the antenna. For now, though, I prefer not to use the ropes. It is so much easier to take the antenna down without them. Even if you don't plan to use ropes, you must sweat on something that will allow you to solder the spiral coil wire without damaging the PVC plug on the coil form with excessive heat. To complete the spiral top assembly, screw the coil form into the pipe, with the mounting brackets (or other soldering post) toward the top. Cut off any excess length and solder the inner end of the spiral coil to the bracket or post. Be careful not to damage the PVC plug with heat. When completed, your spiral top should look a lot like the one in the photo. The vertical element is chiefly a 10 foot length of one inch copper pipe. The only critical thing about this assembly is that it is necessary to slide a guy ring over one end of the pipe before sweating the top end on. Choose an end of the pipe to be the bottom and sweat on a one inch male adapter. Also sweat a piece of wire (I used 14 ga. solid but it is not critital) to the bottom end for attachment to the feed line. 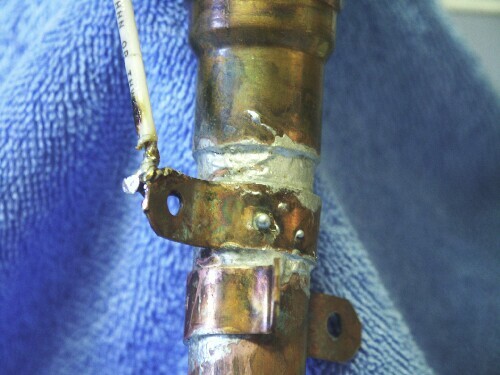 In this detailed photo, the wire can be seen as a ring just above the male adapter sweat joint, and also where it attaches to the coax. Slide a guy ring onto the top of the pipe, making sure it is the right way up (skirts point down). Be sure the ring you just soldered onto the pipe holds the guy ring in place. Also make sure the guy ring can turn freely while straining against the stop. This will make it much easier to install and take down the antenna. Finally, sweat a 3/4 inch male adapter (for 1 inch pipe) to the top end of the pipe. This will attach to the spiral top when the antenna is assembled. 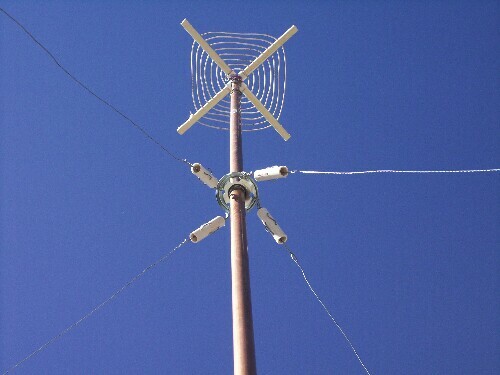 The base of the antenna consists of a galvanized pipe which acts as a mast and a PVC "barrel" which secures the antenna to the mast mechanically without connecting it electrically. 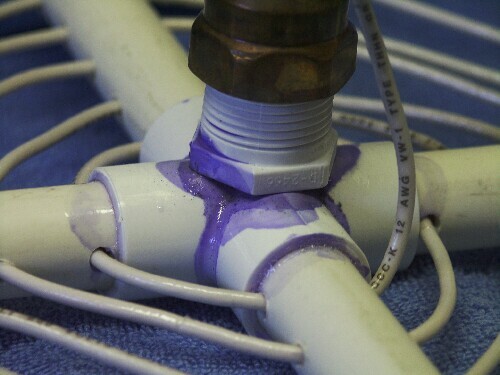 To make the PVC barrel, simply cement two one inch PVC female adapters to a short length of one inch PVC. The pipe should be just long enough that the two adapters touch or nearly touch. Before screwing the barrel onto the mast, it will be necessary to slide a guy ring on. If you use the recommended radio shack guy ring and one inch galvanized pipe, the guy ring won't quite fit over the end. Use a grinding or reaming tool (I used a dremel) to increase the size of the hole in the guy ring. It is not necessary to make it fit over the entire pipe. It only needs to be able to slide down over the threads enough that the barrel can screw on securely. Slide the guy ring over the top of the mast, using the included bracket if necessary to keep it from sliding down. Screw the PVC barrel onto the top. Both the radials and guys require insulators. If you have 24 good quality egg insulators, by all means use them. I had trouble finding any and decided to use PVC to make low-cost insulators. As you can see from the picture, I drilled four 3/16 inch holes through a 4-inch piece of half inch PVC, with interlaced pairs of holes at right angles. (No way that language would be clear without a picture!) The advantage to this approach is that the wires are actually linked, so when the PVC inevitably rots from the sun's UV rays, the structure is still mechanically secure. That's the theory, anyway. Note the way each wire is threaded into one end, out and over the side, then through to the other side, over and back in, then out the end again. Once you have made or otherwise obtained 24 insulators, you are ready to prepare the radials and guys. We'll start with the radials. To make the radials, cut four lengths of 12 ga. copper wire slightly longer than 3.5 meters, such that the radial will be 3.5 meters long once the ends are wrapped around the guy ring at the base and the insulator at the other end. Attach an insulator to one end of each radial. Solder the wire as shown for extra strength. 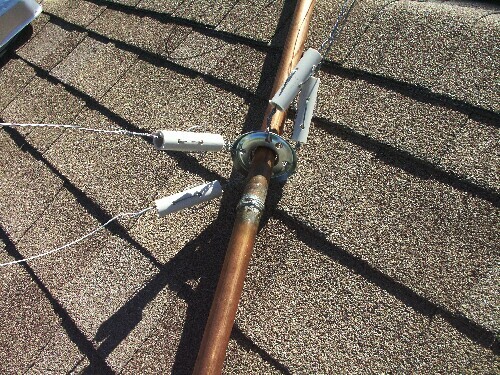 Attach the non-insulator end of each radial to the guy ring at the top of the mast (just below the PVC barrel). Do this by making a loop and soldering it as shown in this detailed photo. Solder a loose ring of copper wire to each loop, all the way around the guy ring, to ensure that the radials are electrically connected at all times. Coil up and tie the radials neatly. They are now part of the base, ready to install on the roof. To make each guy, use steel guy wire to construct a string of five insulators spaced one meter apart, for a total length of 4 meters per guy string. (Longer, electrically continuous guy segments can mess up the antenna's performance.) Make 4 guys, using a total of 20 insulators. Use the shortest length of steel guy wire possible to attach the insulator on one end of each guy string to the guy ring that slides freely on the main vertical element. This detailed photo shows how. Neatly coil up and tie the guy strings. These are now part of the vertical element, ready to install. Find a suitable location at the apex of your roof, surveying where the radials and guy wires will go. Avoid power lines for safety. Once you find a good spot, screw the roof mount down securely with lag screws. 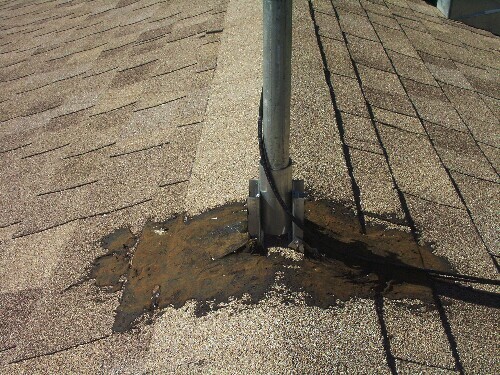 Use roof tar to weatherproof the mount as shown before the next rain or snow. Install hooks for the guy wires and radials at four locations such that the radials will be spaced as evenly as possible (90 degrees apart), and such that the radials can be fully extended (3.5 meters from top of base) and not yet reach the hooks. Place the mast near the mounting point. 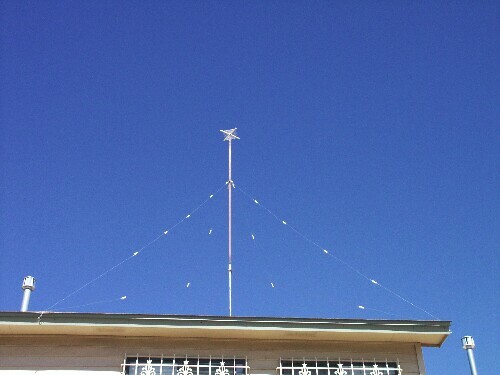 If an assistant is available, the mast can be held in mounting position. Run the radials out toward the hooks (they shouldn't reach yet) and secure them to the hooks with a length of steel guy wire extending from the insulator to the hook. 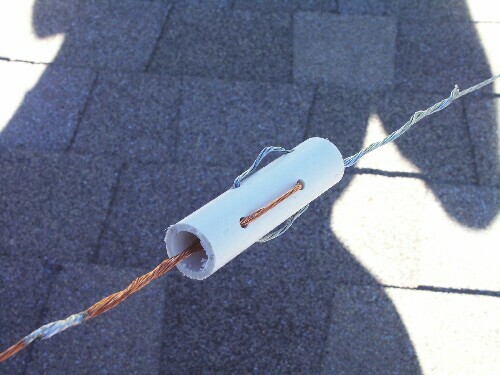 This picture shows what the insulator looks like with one copper wire and one steel wire. Leave enough slack that the radials can be under tension, fully extended, once the mast is raised. Without an assistant, getting these lengths close enough to let go is cumbersome. Be patient and don't risk letting the mast get out of your control. Once the mast is basically in place, adjust the tension at the hooks until the radials are fairly taut and the mast is vertical and feels secure. Tighten the mounting screws and lock nuts in the apex mount to complete the installation of the base. When the guys are adjusted to the perfect length, one person over five feet tall can easily raise and lower the antenna without help. It is necessary only to push the antenna up into the guys, then screw it down into the PVC barrel. Until the guys are perfectly adjusted, though, it can be dangerous to attempt to raise the antenna fully without assistance. Proceed cautiously and have patience, and make all guy length adjustments without the spiral top installed. Now that the guys are adjusted, raising the antenna is very easy. Screw the spiral top onto the vertical element, then hoist the antenna into place and screw it into the base. Connect coax as shown in this picture, without soldering yet, and run it to an analyzer, noise bridge, or transmitter with SWR meter. The only critical adjustment is the length of the coil, which mainly affects performance on the 20 meter band. 5 meters is a bit too long for the spiral coil wire, so you should find that the antenna is initially resonant somewhat below 14.2 MHz. Carefully lower the antenna repeatedly, shortening the spiral coil to bring the antenna into resonance near 14.2 MHz. I ended up with a 4.75m coil length. If you were able to duplicate my design parameters, you should find the performance on the 15m and 10m band to be as shown in the SWR charts. I got my first ham ticket in 1978 at the age of 12, and I've been building the occasional antenna ever since. Most of them haven't worked, but every once in a while, something interesting happens. When I read about Petlowany's spirals I just had to know more about them. I had no idea what would actually be possible. I still feel I know so little. I've put this project on the web in the hopes that someone will write me a breathless email one day, explaining, "No, -DT, you've got it all wrong! A little change here and there and you can have five bands!" Even more exciting would be to learn exactly how and why it works the way it does. In the meantime, it is nice to just enjoy it for a while. Recently I've been content to just haunt the bands, chasing whatever DX gets snared in the burner . Go to -DeeT's Hacks Page.